Los Angeles, CA, U.S.A., 2019-Jan-30 — /EPR Network/ — Learn how and why La Paella decides on digital menu boards to enhance the visual appearance of their menu while improving the way they introduce new items and upsell high margin dishes, desserts, drinks and appetizers. La Paella is a contemporary fast-casual restaurant brand that offers a mesmerizing twist to traditional Spanish dining. From the fresh, made-to-order paella featuring your choice of fresh clams, shrimp, or Spanish sausage to Bocata sandwiches to full variety of tapas, La Paella offers an irresistible menu in a fun, casual setting. To top-off, the dining experience La Paella wanted to deploy a digital menu board solution that visually enhanced their branding while making it easier for customers to view their menu. Upon meeting with Nextelix Connect (NoviSign Digital Signage partner) to discuss the installation time-frames of internet, phone and cloud computing solutions, La Paella expressed interest in digital menu boards. The original vendor that offered La Paella a digital menu board system was over-budget and difficult to implement. Also, La Paella wanted their branding creatively incorporated into the menu design, so it complimented their fresh in-store modern design and layout. In expectancy of new locations, they wanted the solution to be scalable, cost-effective and cloud-based. 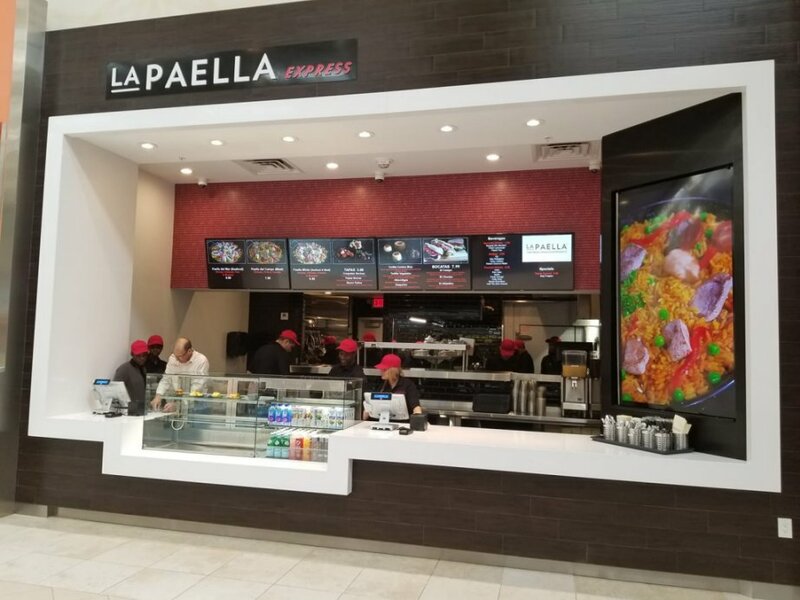 When La Paella decided to make the switch to NoviSign’s Digital Menu Boards, they expected a reliable system that was beautifully designed, quickly installed and easy-to-use. NoviSign’s digital menu board software met each condition. Upon receiving the contract, Nextelix Connect immediately designed and deployed a total digital menu board system that consisted of four commercial-grade Android SoC displays with NoviSign preloaded. Because the displays came with an integrated media player and WiFi, the screens were cleanly mounted flush against the wall eliminating the need for additional wiring. From the ordering counter, customers can easily view the menu items, descriptions pricing and food images. The move to NoviSign’s digital menu board solution was managed swiftly and professionally. The digital menu board layout was quickly designed, and all of the displays were delivered and installed before deadlines. NoviSign's menu board software allows for easy on-the-fly real-time updates of the menu from any computer at any time. Additionally, day-part scheduling is natively included enabling La Paella to preschedule specific menus, featured items and other promotions to automatically play on the digital menu boards on specific times set recurring schedules and or expiration dates. This ability to complete control over the menus ensures accurate pricing across all screens. Nextelix Connect has been providing business technology solutions since 2014, across South Florida and the Caribbean’s, Education, Healthcare, Hospitality and Retail market. Nextelix specializes in technology system design solutions that integrate cloud communications, computing, POS systems and digital signage. Clients include All State Insurance, Helix Urgent Care, Rodriguez-Albuzu Law, Physician Family Pharmacy and Boost Mobile. For more information, please visit: https://www.nextelix.com. NoviSign has helped over thousands of clients across 5 continents successfully deploy dynamic digital signage solutions. Some of NoviSign clients include Disney, Ikea, Dole, Home Depot, NASA, Nokia, Ferrari, Papa John’s Pizza and more! Using NoviSign's comprehensive web-based digital signage software online Studio, you can create beautiful digital signage. With over 20+ drag-and-drop widgets to choose from, you can quickly design and manage engaging content that features live social media streams, data-driven polls, fun interactive games and media-rich zones that feature videos, RSS feeds, HD images, scrolling text, weather and more! For more information, please visit: https://www.novisign.com.